It took me some time to post my first burger recipe on this website. Since I got my meat grinder for Christmas I started making my own burgers more often. So here I am with another delicious burger. In fact it’s even better: 2 different versions of the Lemon Orange Burger. 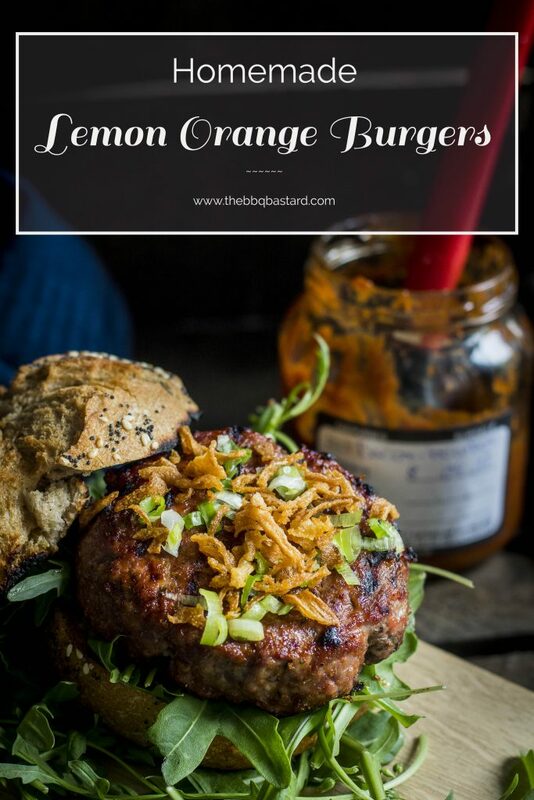 “The Lemon Orange Burger” is perfect for hot summer days like we have over here in Belgium at the moment! Don’t expect the regular heavy spiced burgers but a refreshing Burger with hints of orange bringing a subtle surprising note. Disclosure: "This post contains affiliate links, which means that if you buy one of the products through the mentioned links, I'll get a small commision to keep this blog running. All opionions shared are my own." 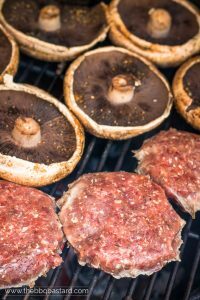 Before I had the chance writing down the recipe for these burgers I already made some different versions. The one somewhat healthie than the other. It’s for you to chose what you prefer. Or just take the best of both. The first version is made with portobello buns and a lemon peri peri based mayonnaise. The second is a more classic version with regular buns and Bacon Bourbon BBQ sauce I got from my friend Jasper. Both were delicious (Otherwise I wouldn’t share them)! The Bacon BBQ sauce for the obvious reasons: Bacon and Bourbon. Those ingredients fit almost every recipe! Since the Bacon Bourbon barbecue sauce is rather heavy I didn’t add cheddar cheese to this version of the burger. The second version comes with portobello buns and cheddar cheese. 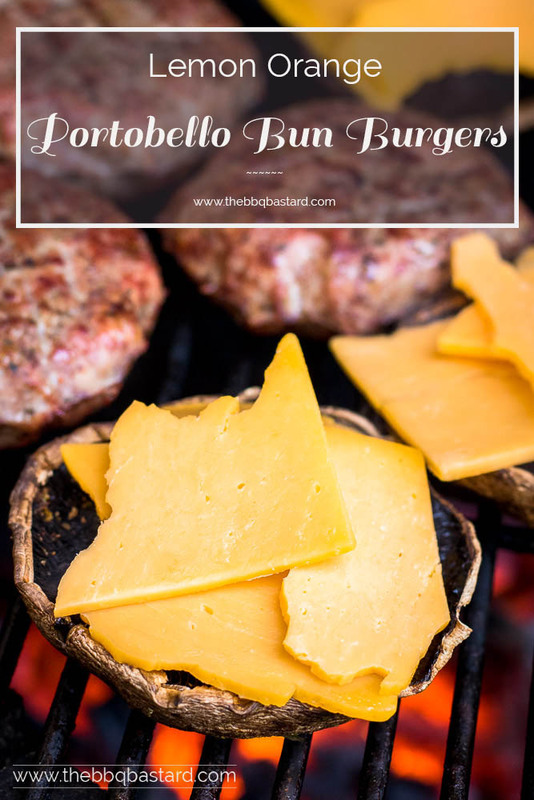 There are a couple of reasons to use Portobello Buns for these bugers! To be honest I’m not the biggest fan of regular buns. In fact they should be very good to add some value to a burger. But these Grilled Portobello buns flavored with fish sauce, salt and pepper are an extra ingredient bringing a lot of umami to the complete lemon orange burger recipe. Second reason: In my opinion bread and french fries are to much fun to enjoy. Maybe my healthy wife got more influence on me than you would like… But I don’t complain about it! As long as it tastes good! You might hear about her soon on this blog. She’d like to learn how to BBQ (more women should). You might read about it later on. Third reason! Just look at the picture above! How cool do they look? When I make burgers I always make a stack of them for the freezer. It doesn’t take much longer to grind some extra meat (I’m happy with this mincer). As result you’ll have some decent burgers for those moments you need a quick meal. 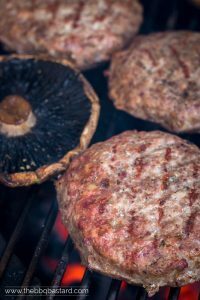 While making these burgers I always love to experiment with some of the burgers and try new tastes. I realised I always make my burgers with rather classic heavy tasting spices. But why not a fresh tasting burger with some notes of citrus? And here it is the Lemon Orange Burger. The citrus taste comes from the lemon pepper I bought and the orange salt I made from scratch. You can easily make them both yourself (instructions in recipe). To support the citrus flavor I added some cilantro, sage and fennel seeds besides some classic burger spices. 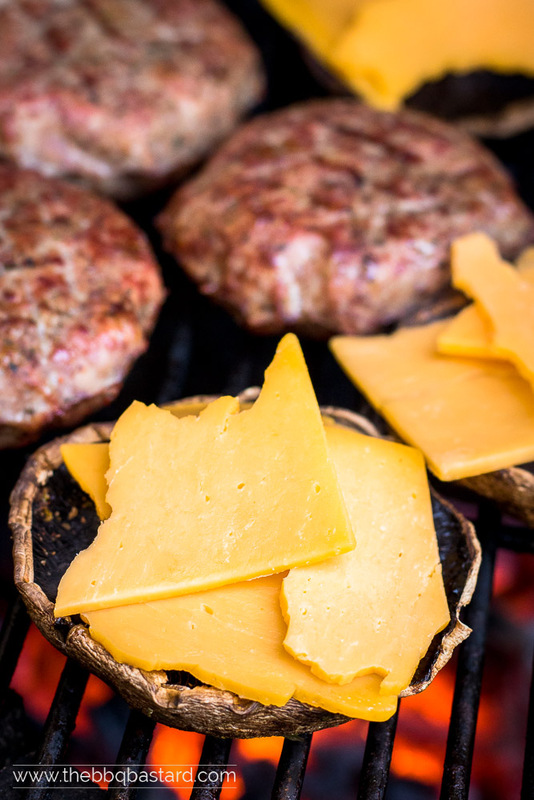 Next to the portobello buns and the lemon orange burger, I add some cheddar cheese to the recipe. I was a bit afraid the citrus taste wouldn’t be powerful enough to cope with the heavy cheese but it did a great job after all. Furthermore I add some arugola and tomato and last but not least fried onions. Just because taste goes above healthy reasons. After I made the pictures I added a sauce made of two parts mayonnaise and one part Peri Peri (lemon and herbs). Ready to serve your delicious lemon orange burger with portobello mushroom buns. Thank you for showing interest in the “Lemon Orange Burger”! But there’s more: the best thing about BBQ is getting some interaction and learn from each other. So come join us and share your own projects, questions, favorite beer, or other cool stuff at the brand new Facebook group: beer, booze and bbq. To work easy and efficient start by cutting the meat in dices from about 2cm. each and freeze them for an hour. Doing this you will notice the meat will be easier to proces in your meat grinder. After an hour the meat will have a firm texture. Grind it with the large blade of your meat grinder (8mm). Burger purists need to stop here but I like to grind it for a second time with the medium screen (4.5 mm) for a firmer texture. Form meatballs from about 150 gr. each and put them in your burger press. I use one like this. They don't cost much but do a great job! Grill your burgers until your reach an internal temperature of 74°C/165°F. It will take about 5-7 minutes on each side. Clean the citrus fruit of your taste (orange, lemon, lime, ...) thouroughly. Remove the zest with a thin peeler and make sure your zest doesn't contain pieces of white zest (the bitter part wil ruin the taste). Spread the zest over a baking tray and pat them dry with a paper towel. Dry the zest in your oven or BBQ at a temperature of 80°C/176°F for about two hours (or more) until it's crispy. Crush the crispy dried zest and add 1 tsp. to 85 gr. (4.5 tbsp.) of salt. You can also add it to pepper or mix them through. 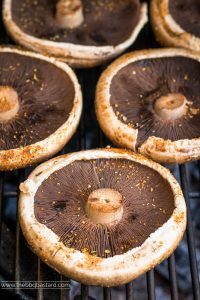 Clean your portobello buns and sprinkle them with fish sauce, salt and pepper. Mix two parts of mayonnaise with part of peri peri lemon sauce. Compose your delicious burger with ingredients at taste: tomato, arugola, sauce and fried onions. For these burgers you make the Bacon Bourbon BBQ sauce (or ask a friend to get you some). While the burgers are grilling add some of the sauce before flipping the burgers in the middle of your grilling session. This way the sauce gets the chance to caramelize. Compose your burger by adding arugola and tomato to the burger and sprinkle some fried onions on top. Some pickled vegetables would do excellent with this version too! My intent with this blog is sharing some recipes as a source of inspiration for you for free. To Bring this content some costs need to be made. To cope with the costs I use of affiliate links. These links bring me a small referral commision when you buy a product through this link. This support helps me running this blog. I guarantee no false statements will be made on this blog and only products I believe in will be linked. I hope you understand this decision. Thank you! :). - There's an affiliate link on the  "Peri Peri Lemon sauce", "Meat grinder", "Burger Press" and "Lemon Pepper". Sweet potato pulled pork nachos – your go to fastfood meal! 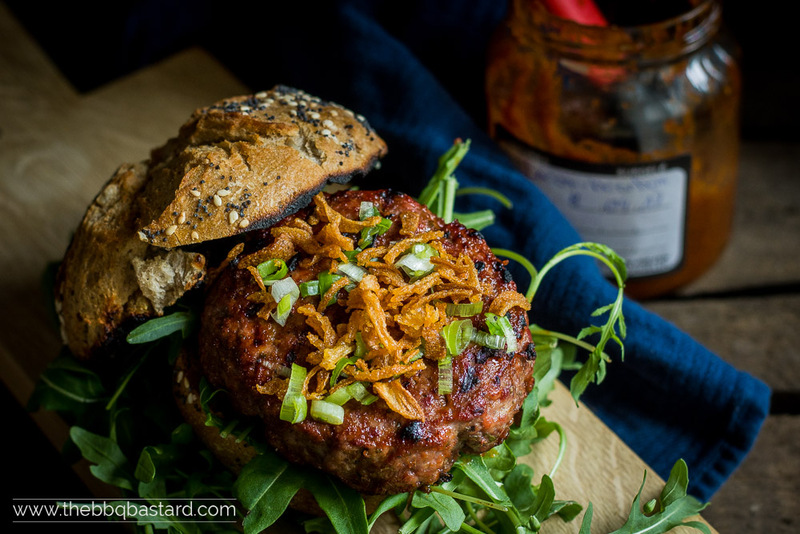 The flavours in these burgers sound so amazing, perfect for summer! Will definitely give them a try! Thanks Betty! Yeah they are awesome for summer nights! A slight note of refreshment does the trick! Thanks for stopping by and taking a moment to comment!